Lord knows I am not a huge TV fan (I don't even have cable people!). 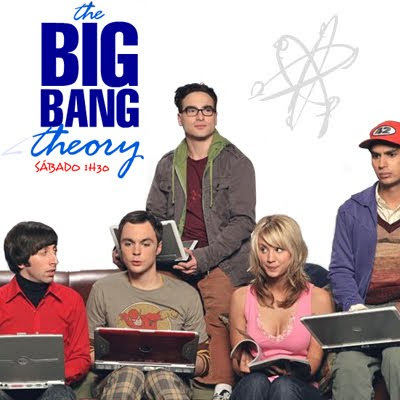 But there is this one little show that knocks my socks off: The Big Bang Theory. Ok, you knew that one was coming. So, this week's Friday Top Five will consist of the top 5 reasons why I heart the BBT (of course it has its own acronym...duh!). 1) Bazinga! Seriously, ever since Sheldon graced the world with his Bazinga-zing I have been hooked on using it in everyday conversation. 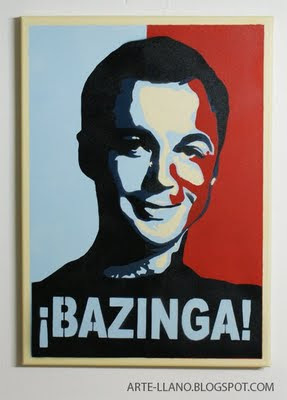 It has also Nerdy-April-morphed into such words as Bachinka, Bajanga, Bayanga, and the occaisional bazinga-licious! 2) I may or may not have a circle of friends nearly identical to the boys on the show. And the funny part is the reaction my parents had during my NASA presentation. While I was waiting to present my Howard-like UAV Aeronautical design, a slew of Raj's and Sheldon's and Leonard's were attempting to hook up the projector. It took about 10 minutes and my parents were nearly rolling on the ground laughing (it was so similar, it was freaky!). 3) According to Sheldon, an Aerospace Engineer (i.e. me) is equivalent to a toll-taker at the Golden Gate Bridge. Sweet, San-Fran here I come! 4) Sheldon has an unusual attachment to his usb-drive. I share a similar attachment to the point of a panic attack should it be missing. 5) Here comes a little nerdy: on the side I actually LOVE to read about the theory of relativity and specifically black holes and time dilation. So, I can totally get my nerdy on when the boys start talking theorems and light years. And the looks from my family when I try to explain what they are talking about are priceless!